Sarine Tech has been uptrending for a long time, since 2009, recently before the market correction it still break new high. 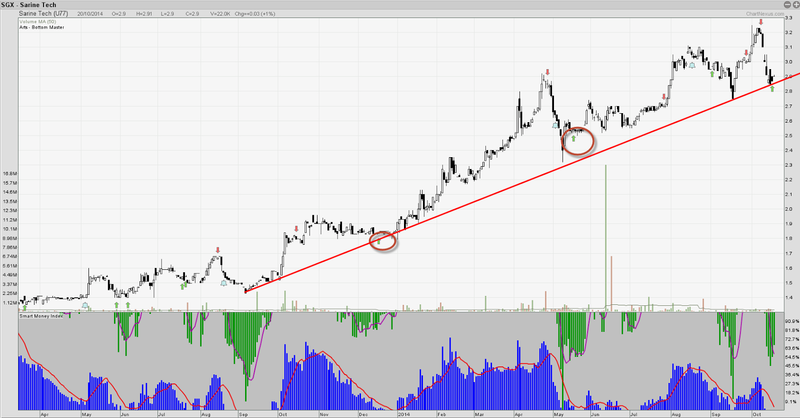 What we see here is this stock is still on an uptrend, Higher High, Higher low. Currently it is at the trendline support. Our Bottom Master system show that this could be the short term bottom for this stock. The trend could possible end if price break below $2.72, hence traders need to watch out for this stoploss point. In our upcoming seminar, we will explain more on how to catch a bottom safely.